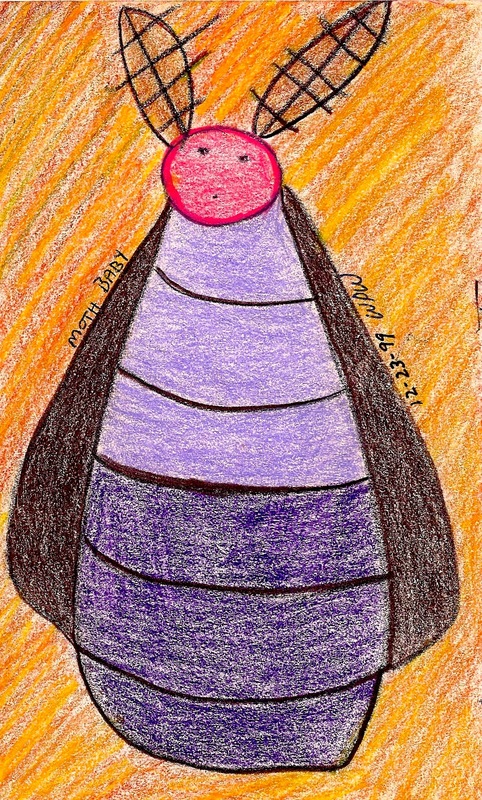 Here is Moth Baby, my colored pencil drawing, 1997. The feathery antennae, the bulky body, wings folded, no legs, pink face of a human baby. The lines across her segmented body mirror the stitch-marks of my scar from my surgery at 26 days old for pyloric stenosis, a stomach blockage. For me, moths have always been a symbol of death. Before the surgery, I was slowly losing life as my body weight slipped from 6 pounds, 7 ounces to 4 pounds. Death was having its way with me. Recently, I opened a magazine, and to my horror, a huge image of a moth greeted me. I stared in shock, unable to breathe. Instantly, I knew it was a trigger and that I had to wand it in EMDR therapy (Eye Movement Desensitization and Reprocessing). The image on the page had completely unnerved me. In fact, every time I opened the magazine to that insect, I freaked. That moth was out to get me. I remembered a series of moth poems I wrote in 1995 while I was practicing Middendorf Breathwork, a somatic bodywork in which one comes to know the allowed breath–not the willed breath or the autonomic breath that just happens and sustain us–but the conscious breath. I was coming to understand why my breath had always been so shallow. And in my poem “The Imagined Escape of the Moth,” I tried to free myself. fluttering free into new life. After fourteen poems in this series that year, the moth still hadn’t flown. Over twenty years later in EMDR therapy, I open the magazine to the picture of the moth. Instant distress in my chest. Panic. The wanding begins. The process is quite complex. After 30-40 back and forths of the wand, my therapist checks in with me, and I report the internal story that unfolded as my brain regrouped. During the seventh or so wanding, a moth flies to me and hovers, its body that of a human baby. It asks me to fly off with it into death. I grin and shake my head no. Go away, I tell the moth. I’m going to live. As I say these words, I am not angry. I am clear-headed and powerful, communicating my decision. No. The moth flies off. A beautiful butterfly with buttery orange wings and a happy human baby as its body hovers. The fear of death is gone. After the session, sitting in my car, I look at the picture of the moth again and smile. It is innocent. It is itself, a sacred creation. I am no longer haunted by it. I am curious–about the moth and about my new life, my future. I pen a new poem. ← Don't Distress. Effervesce with EMDR! So glad the poems speak to you! Would love to read one of your bird messenger poems. Gosh, that “Snow White-like in a glass coffin, waiting” kind of defines my life, living with PTSD. As a baby, I was given a muscle paralyzer so I wouldn’t squirm when a tube was inserted into my throat and when my gut was cut open. Yikes! I was helpless. According to the trauma expert Dr. Peter Levine, it’s the helplessness and inability to protect the self that causes a lot of the PTSD, moreso in some ways, than the trauma itself. I’m sure that CoA experience was brutal and what can one have done about it? btw, I’ve been EMDR wanding some of my past experiences, living in our homophobic society. It’s helping. Hope you find something valuable in my posts.